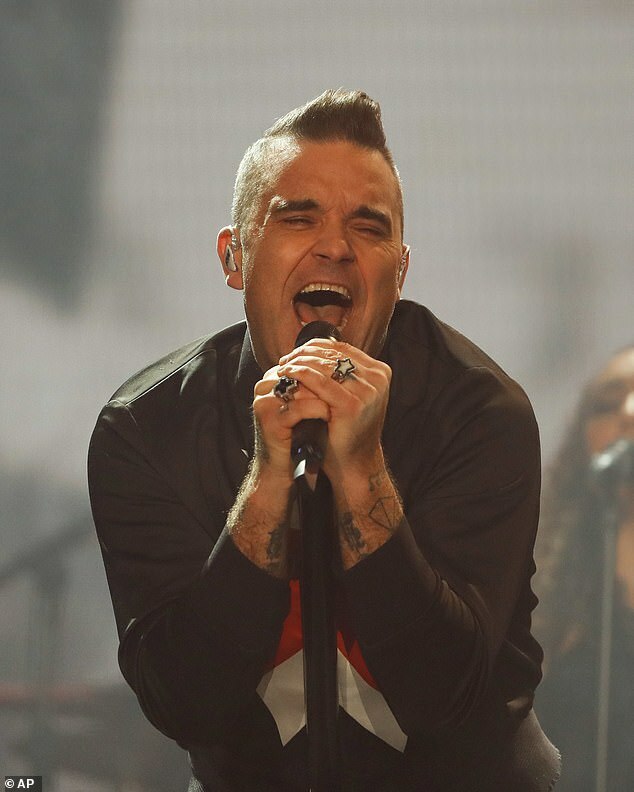 Robbie Williams told a pair of 20-year-old fans on Wednesday night that they're 'good' to 'carry on' taking drugs while they're still young. 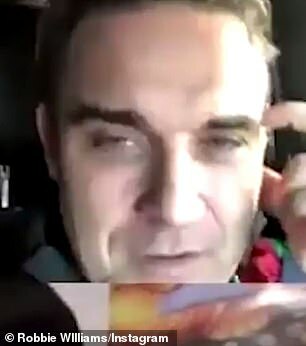 The moment was captured in a now-expired Instagram Live video and saw the 44-year-old Take That star advising the young men on which alcohol compliments ecstasy. 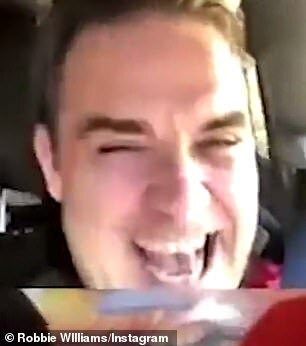 According to the Daily Star, the father-of-three - who has a known past with drug use and admits to being 'high' when he first met now-wife Ayda Field - was asked whether he still uses drugs now. He then, however, went on to ask them their ages, to which they replied 20. 'Twenty? Well you're good. Carry on. I know it's a gag but are you talking steroids, speed, or weed? Carry on, have a great time and write it all down so you can have it in your memoirs,' he replied. 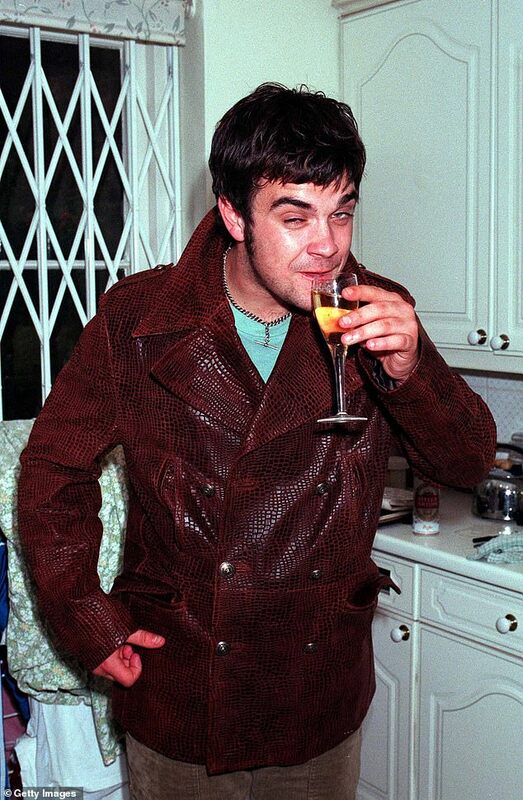 The young men told Robbie that they had been drinking rum, after which Robbie took it upon himself to document what alcohol goes best with which drugs. 'Rum is great. Whisky is just f**king weird. Rum is a lot of fun. Do you drink Drambuie?' he asked. 'I mean not that you would ever take ecstasy, but it goes very well with ecstasy... not that you ever would,' he was sure to add promptly. 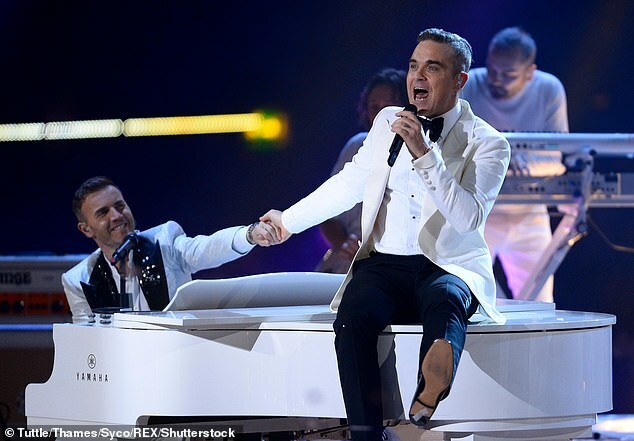 MailOnline has approached reps for Robbie for comment. 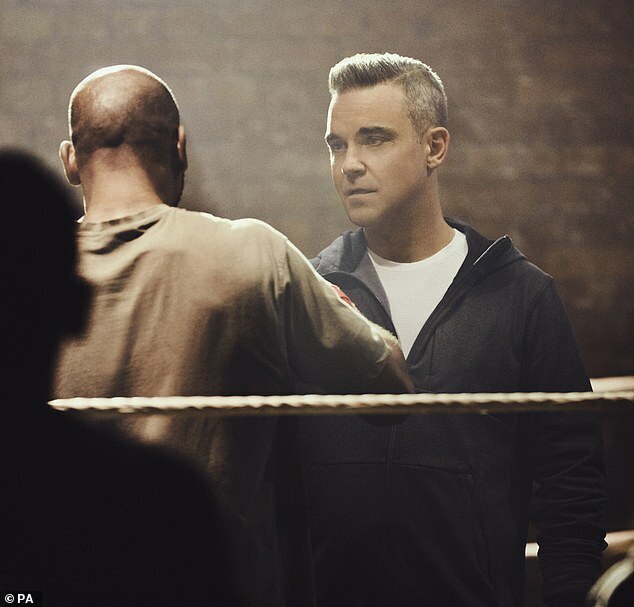 In the past, Robbie's life as a pop star has seen him indulge in morphine, speed, cocaine, magic mushrooms, Adderall, Vicodin and Seroquel - 'and a few more things' - during the 1990s and early 2000s. His book - Reveal [released last year] - saw Robbie candidly discuss his past substance abuse issues, and his battles with anxiety, weight and stage fright. He recalled that whilst taking drugs he 'sat on a sofa, ate potato chips and chocolate, got fat and grew a beard'. He added that when meeting his wife Ayda Field, he was under the influence of drugs, explaining how he prepared to meet her for the first time, asking her to come round to his as he didn't feel able to leave his house. Robbie then took Ayda back to the party she had come from and said he 'tucked into a lot of drugs' at the event, with disastrous results. 'I took a turn for the worse, because I started to cluck like a chicken,' he admitted. 'There was a moment in the Jacuzzi where Ayda had gone and got changed and she came in wearing this Ursula Andress bikini, and she had a killer body. Despite their unorthodox first date, the pair went on to marry, and will celebrate their ninth wedding anniversary in August. The couple have children Theodora, six, and Charlton, four, and welcomed their third child, Colette, via surrogacy four months ago.